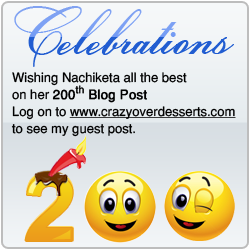 I was invited to do a guest posting on Nachiketa's blog *The Variable - Crazy Over Desserts she wanted me to help her celebrate her 200th posting and since Nachiketa's blog is full of happy grinning people enjoying her fabulous food creations (really her blog is all about the exultation of joyousness). I thought this guest spot would be a great opportunity to give her readers an extensive posting on picnic recipes. I have been collecting picnic links and recipes for a long time and have a large hoard of them. 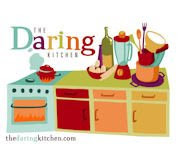 My guest posting has over 200 delicious, tasty and simple picnic recipes that are perfect for any sort of celebration, jubilation or party I thought these recipes would really compliment her blog. Please click here to be transported to a wonderful blog all about happiness and food bliss. This is a guest post for Nachiketa of The Variable, Crazy Over Desserts - Nachiketa. You can also Catch her on facebook @ Crazy Over Desserts Join her page and leave a comment to become eligible for her special Giveaway prize. Thank you for the neat info.